Xander Phoena was gracious enough to invite Mynnna and myself onto his show, Crossing Zebras, to talk about industry/market topics post-Odyssey. It was a really fun interview. I always feel outclassed by Mynnna since he has access to data, tools, and market makers like I could only believe. He's been the person I've bounced the weirder market behaviors off of to try and get better intuition as to what is actually happening. The first official question that Xander posed to us had to do with personal wealth; positing that we're both trillionaires. I can't speak for Mynnna, but I was rather candid that my value isn't that astronomical, though I am pretty sure my "only 100B net worth" humblebrag will probably be seen as the opposite among a lot of readers. I should really get some tools to better track ISK like marketsforISK does on his blog or EVE-Fail, but I try to keep my view short rather than try to watch the grandoise trend. Instead, I keep my eyes on the week-to-week to try and make the best decisions with the tools/data I have to leverage what I have effectively. And the second truth is I've hit one of those pesky plateaus. To my younger readers, this looks like a lot, but to my older readers I'll look maybe a little foolish that "that's it?" Without going into cliches about being 1% or first world problems, the honest truth is that I am still at the point where I can point to several friends/corps/projects and say "yeah, but they are doing x factor more than me". Again, EVE-Fail recently hit 100B liquid and over 1T net worth. My friends in Aideron Technologies are on track to sell 1B/day for the whole year. There are a dozen other friends who can throw down liquid cash in factors 2x or 4x what I can today. The simple truth is we judge each other against our peers, and I am still middle of the pack against my personal friends. The black line is %margin, purple at the bottom is profit per character. And the red line is what really tells the story here. Despite the kit and sales lines growing, the profit line is the gentlest slope. It would be negative if it weren't for active management and growing the buy-ins to try and grab for higher payouts. 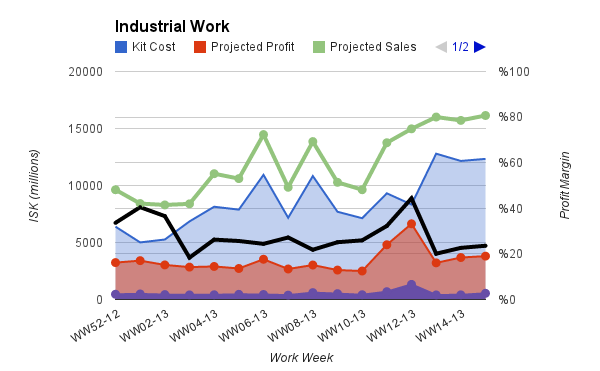 Other than the Odyssey blip, the growth in my program has been mostly in costs, not in profits. The fact is that asset growth is going to plateau periodically. Usually around the various factors of 10. "Making 1B easy" is a much lower goal than "making 5B easy". Having 1B operating purse is much easier than having a 10B purse, which is much easier than a 50B purse. Right now, I'm in a slump trying to justify moving from 15B/kit to 20B/kit operating budget. As the buy in grows: my gross margins shrink, the effort increases, the risk increases, the cycle time increases. This means each additional billion I push in, the less the return I will see from that added investment. Frankly, I am still getting the desired return per character I've been accustom to, but I have been growing and growing that buy in pot to match the expected margin. Today, this is a function of the market as a whole, the summer doldrums make it tough to rake in the ISK, but over the last year, I've been increasingly hard pressed to hit that 30% margin goal. The best question after all this humblebragging and frustration on how little good all this liquid cash and industrial horsepower is doing me... why do it? The first is to have an income strong enough to play without worry. That means dropping 1B on equipment on a deployment. That means just grabbing that ship you want to play with. It's similar to getting that first decent salary job. No more worrying about that one bill that will totally break you. I'd like to grow the income to better balance out more PLEX purchasing without balancing those expenditures against the kit buy-in growth... but that's personal accounting more than actual income. I think I am essentially there. The second goal is to break through that 1PLEX/char/workweek ceiling. It's an enormous pain that if I want to break through that number, I have to basically re-factor the entire manufacturing team to ships only. This gets logistically painful and is incredibly risky. As I've said over and over, the richest ground in T2 is shrinking, and in T2 ships that land is going to get very sparse unless something drastically changes the T1/T2 ship balance. Also, if I push for all 8 producers to be full-time ships, that means my production kits will push over 25B and those hauls become FAR too risky/heavy/often to be doing personally. I am entertaining some ideas to diversify and try some new activities. I have yet to touch T3 and if my estimates are right, I should really get the pieces together for reaction farming.